View all work in the two hearts series. The series Two Hearts was birthed from my paintings Dreamers and The Dance where the human embrace was the dominant theme. I wanted to expand upon the body language associated with the consoling nature of hugging but express it in an abstract way. Two figures lay embracing, dancing or sitting in a rather dark palette, thickly combined with other specific colours to represent the two figures’ emotional and psychological values. 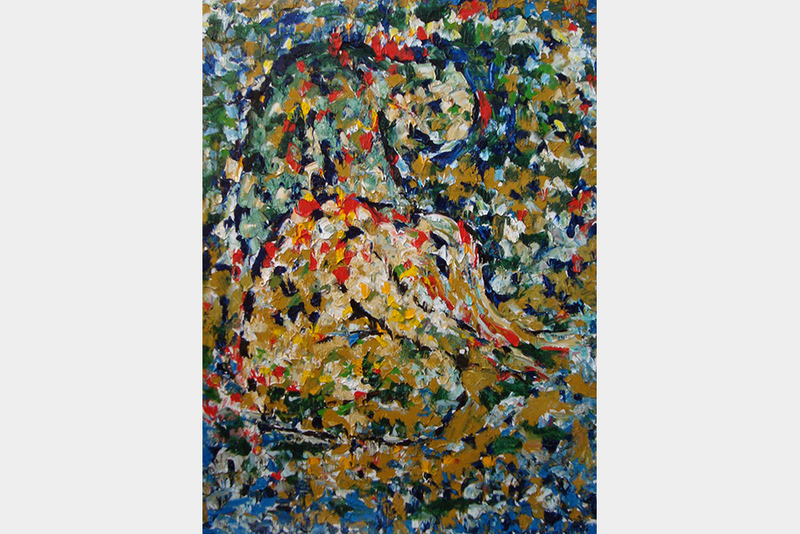 The painting was created in a unique way by using an impasto technique. This involved thickly laying down oil paint with a palette knife, pressing both canvases together and then carefully controlling the separation. The effect produced by the separation became the mono print. This process is in keeping with Decalcomania that appeared in 1936. Adopting this process allowed me the freedom to produce an automatic quality of abstract figures that I couldn't capture in a realistic style. Two Hearts was birthed from my paintings Dreamers ..."